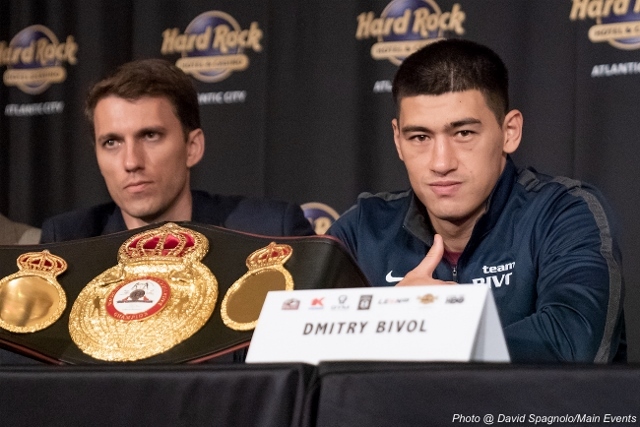 The next fight of the WBA light heavyweight champion Dmitry Bivol is scheduled for a date in March and the contest will be held in the United States, and his opponent will be announced after the holidays, according to the Russian boxer’s manager Vadim Kornilov. The 28-year-old Bivol has won victories in all 15 fights (11 by knockout) in the professional ring. “We are negotiating right now on Bivol. A fight is planned in March in the US. I think that immediately after the New Year we will immediately announce the channel on which Bivol will perform as well as the opponent,” said Kornilov to Vasily Konov. Kornilov also revealed that as part of the card which is going to future Bivol, Russian heavyweight Sergey Kuzmin will be scheduled to perform. The 31-year-old WBA Intercontinental champion has 14 victories in the professional ranks. Last month Bivol won a dominant twelve round unanimous decision over former champion Jean Pascal. Bivol has been growing his American presence on HBO, but a few months ago the network announced their decision to drop boxing, after 45 years, from their programming future. HBO’s decision left Bivol in the free agent mix. There are three major options for the talented boxer – ESPN, which has an exclusive deal with Top Rank. WBC champion Oleksandr Gvozydk and WBO champion Eleider Alvarez are aligned with ESPN, and Gilberto Ramirez may be heading up to 175 very soon. There is Premier Boxing Champions, which have content deals with Showtime and FOX. Fighters like Badou Jack, Marcus Browne, and several super middleweight who may be moving up. And then there is the streaming service DAZN, and their biggest opponent for Bivol would be a unification with IBF champion Artur Beterbiev.